Consider this the fix it button? One of our pages has a message. Share the message with us when you call to schedule your service. IT used to be a support function, with an isolated group of specialists huddled in the data center looking out at the organization. Today, however, IT is in the people business. Current IT requirements include managing the devices people use, the applications your employees need to access, and the support your team requires, and Terabyte Technologies' job is to empower the people who make your business run. At Terabyte Technologies, we have a people-centered view of delivering IT services. Through this approach, our clients experience major improvements in service delivery including improved productivity, simplified management of the computing environment, and optimized infrastructure - which translates into significant business impact. We specialize in security, up-time, ease of use, and even fixing issues before the users experience any inconvenience. Our focus is to help organizations achieve their business objectives through their most important assets: their people and their systems. When technical issues arise - you don't have to take your employees off of Mission Critical tasks that could deliver more value to your business. Ensure that your workforce stays productive while we take care of technical problems. And because most problems can be easily remedied over the phone, you're spared the expense and the wait of an on-site visit. Supporting your end-users sometimes requires more than just a phone call. The Terabyte Technologies team provides a personal touch by arriving at your office to troubleshoot problems with software applications, operating systems, printers, and network connectivity. Our certified technicians are not only knowledgeable, but are also friendly and courteous. The Terabyte Technologies remote support program specifically addresses the challenges of a mobile and distributed workforce. Wherever your users are: at home, in an office, hotel, airport, etc., Terabyte Technologies can support them. We remotely attach to their computers and provide comprehensive support anywhere, anytime. Our technicians troubleshoot hardware and software issues as well as install and/or upgrade software. Even patch management, software deployment and asset tracking can be handled remotely. Since these calls generally require an extended resolution time, users can schedule a remote session at their convenience. Today's workforce needs flexible support solutions available anytime, anywhere. Not only can Terabyte Technologies remotely trouble-shoot and resolve issues with your end-user desktops and laptops, but we can also remotely connect to mobile devices to diagnose and resolve issues, configure and support your server environments to support your mobile workforce. 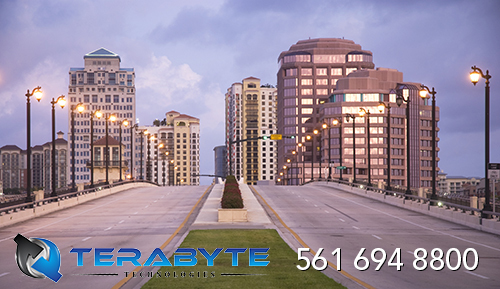 Headquartered in West Palm Beach, Florida, Terabyte Technologies is a Microsoft Certified Partner. Contact Terabyte Technologies for your Florida computer services needs today at 561-694-8800.